The CathPal I and IITM work together to secure the catheter and transfer set in place. CathPal ITM secures the transfer set with one adhesive end, allowing the patient to release and re-secure the transfer set mulitple times for ease of use with dialysis. CathPal IITM secures the tubing of the catheter more permenantly from the patient's exit site with two adhesive ends. Instructions for using the CathPal I & IITM to secure your Peritoneal Dialysis catheter. 1. For optimal results, apply the adhesive to clean dry skin. 2. To secure the catheter, start with the CathPalTM II (smaller piece) by wrapping the middle, non-sticky part around the tubing and applying pressure to secure the tube. 3. Peel off the protective covering for the adhesives and adhere them to your body. 4. With the adhesive facing outward, wrap the CathPalTM I (bigger piece) around the transfer set and apply pressure to secure the transfer set. 5. Peel off the protective covering for the adhesive and adhere to the body. 6. 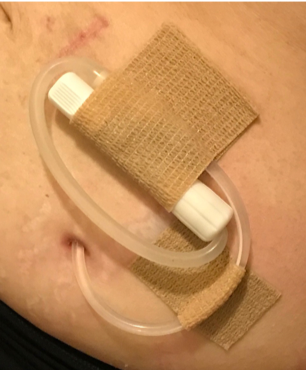 To access the transfer set for Peritoneal Dialysis, carefully detach the CathPalTM I to release the transfer set without removing the adhesive to your body. 7. After dialysis, re-secure the transfer set by wrapping the CathPalTM I around the transfer set and applying pressure to re-secure the transfer set. 8. Change the catheter securement wrap daily, when wet or more often, if needed. The CathPal I & IITM shown in this picture is modeled with a Peritoneal Dialysis catheter and the transfer set. Please revisit our website periodically for updates on new products and designs our company is working on. We always love to receive comments and hear from our valued customers. We respect your privacy and will not share your email address with any third party sites. Please leave your message today! We appreciate your comment, thank you!